The debate opens up with moderator, Iowa Congressman Steve King who thanks the debate organizers and proceeds lay out details about the national debt crisis. GINGRICH: If we are stupid enough to do nothing about the debt, we will be bankrupt like Greece. Paul Ryan would fundamentally change Medicare by getting younger Americans into a premium support model — I do not favor a mandatory premium support model. I want us back into the habit of giving Americans a range of choices so people have those choices in the free market that would beat out the bureaucratic system. They need to go to something because it is better for them not because the government forced them. Americans are not going to let politicians impose things on them. We have to come up with solutions that are actually BETTER than what the government would force on you. Look at WalMart, people shop there because they think they will get a good deal. We need to defeat so many entrenched elements of the Left that we have to convince Americans that we represent a better future than the Left does. CAIN: I am supposed to have a minute to disagree with Gingrich, but I don’t disagree with anything. So I would like to instead to add a historical perspective, since Gingrich and I can change the rules as we go. I remember talking about Medicare when I first went to Godfather’s pizza. Things inside the company were easier to control outside. Medicare started in 1965 and our government told us it would cost $6 billion to rollout, and we were told that by 1990 it would cost $12 billion. But in 1990, it actually cost $109 billion. IT WAS A 900% MISS. How many businesses can survive missing a target like this. Long term government projections about cost have never been right. NAME ONE. Politicians have over promised for decades. We have got to get real because we are headed off a cliff. What to do about rising healthcare costs…services, x-rays, etc…going up 17% regardless of the economy in a market of their own. Why does it occur and how do we deal with this? CAIN: We have the best healthcare in the world. GINGRICH: I think that the mess of the health system is an everything problem. It is federal, state, doctor, patient problem. You can go back to 1943 wage price control decisions which was a gimmick in WWII, but what happens in a third party payer system. The person receiving services isn’t paying so they don’t value it. The person writing the checks thinks the doctor is a crook. When you get the government in the business of defining what you should have, the government will say you don’t need this or that when you do. CAIN: I will make this brief. In the private sector for decades now they have been making the change from defined benefits plans to define contributions plans. It is your money. And so what the Ryan plan does with Medicare accounts is that they have individual names on it with defined contributions where everyone will have an account and own it and spend more responsibly. GINGRICH: I want to ask Cain what happened at Godfather’s regarding the encroaching of government when CEOs are faced with the out of control bureaucracy. My advice to them is something I realized when I first became CEO in 1986. If I did not get involved in these issues then the entire free market system would be collapsed. Don’t stand back and play it safe. Get involved with the solution. I want to congratulate the Tea Party for putting these talks together and educating people. Better informed people will change this country. You are all becoming better involved. The Tea Party movement is real and growing. The Left is calling people racists to scare them away. My advice to CEOs and business people is to get involved and not sit on the sidelines. You can’t stop it with expensive lobbyists down the road. GINGRICH: As a business, you don’t get to stay in business unless you wake up every day thinking about how to keep customers. If you don’t earn your pay in business, a business won’t pay you. We need to apply LEAN Sigma Six principles to government. CEOs set big goals with tight deadlines, delegate smartly, and don’t let any so call experts in the room. Social Security Reform…. 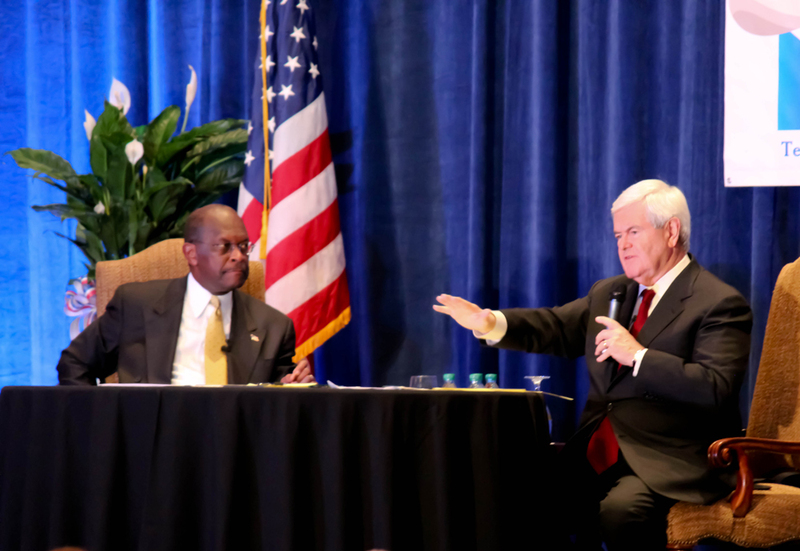 CAIN: Social Security….I am a firm believer in solving problems. Old ideas have prolonged the problem. I am a strong proponent of an idea that Bush introduced, these optional personal retirement accounts. 30 countries have optional personal retirement accounts. Look at the Chilean model and I ask why can’t we do that? We can do it if we fight the demagoguery and fight all those who don’t want the current system to change. We need to educate the public so they understand this. I am about fixing the problems. Payroll tax is the biggest tax that most people pay. We should be invited back to talk about the economy at another time. We have to change the tax code. It is one of the reason that healthcare costs keep going up. It makes no sense. It promotes the idea that this is all someone else’s money and not the employee’s. CAIN: We as a nation are not short on good ideas of how to fix social security. What we are short on is the ability to educate people on the solutions. CEOs can help educate and inform their workers on what is truth and what is garbage. I believe the businesses in America could provide a service of changing the paradigm of DC and inform the employees on what is fact and what is not. It is a fraud and a lie the way that Congress deals with social security. The American people have put money into a trust fund. It is not hidden. It is there. But every politician in Washington wants to find a gimmick to balance the budget off the backs of working Americans. GINGRICH: The private sector money in a personal social security account goes into the private sector. There will be a 1% increase in economic growth just because of the amount of capital that would be saved. In Chile they now have savings in their social security accounts that equal 76% of their capital. That is breathtaking and longterm and stable. We need to have separate money between social security and what would be in the private savings account. CAIN: I absolutely agree with block granting to states. IN order to solve the problem, the states know better how to use their resources to provide the greatest amount of help to their citizens. Medicaid has gotten states hooked on it like crack. We have to break the crack habit with block grants. The states over time will have more flexibility. We should not cut them off cold turkey, but we need to start to end the dependency of states on Washington bureaucracy. We need to end the mandates to the states and let the states decide. Public Housing — if we give people a place to live, they need to help clean it, paint it, and fix it so they have skin in the game. The Left’s Model: people are weak, helpless, and stupid and need government to tell them what to do…but who does the Left think the government hires to run the bureaucracy? CAIN: We need to have standards and not make it easy for people to cheat on things. You can’t get on an airplane without showing a valid ID. Why should we allow people to do other things without IDs. Photo IDs are needed and should be required to vote to end fraud. WHY NOT? CAIN: We need to change entitlement to empowerment programs. You need to prove you are looking for a job or are taking classes to get a better job. Means testing will help but you need to make people take ownership and WANT to get off those programs. I would block grant all entitlement programs back to the states and give them the flexibility on how to modify the programs and stretch those dollars. We need to fundamentally change unemployment compensation. We need to require training. 99 weeks of unemployment sitting doing nothing could be turned into an associate’s degree. I think that each state needs to have primary responsibility for most of these domestic issues. CAIN: The nitpicketyness of the media. I did not realize the fly speaking nature of the media when you move up in the polls….because if there is a journalistic standard, they don’t follow it, and too many people give out misinformation. I thought that — and I did not study political correctness in school — too many people in the media are dishonest and do a disservice to the American people.